What We Do: Innovate. Impact. Be Unreasonable. We organize the Social Impact Summit, our annual event that brings in an array of all-star social entrepreneurs in an effort to educate attendees about social entrepreneurship, inspire attendees to become changemakers in their communities, and facilitate networking among those with a passion to for social enterprise. Click here to learn more. Operates our NIU famous CAUSE Pizza venture. During our weekly pizza sales we sold over 5,500 slices in only three semesters! Manages our sponsorship platform for the Social Impact Summit. Without the development of this platform, selling of the sponsorship's, and maintenance of the partnerships, the Social Impact Summit wouldn't be possible. Click here to check out this year's unreasonable sponsors. Handles all aspects of recruitment of new members. Interested in joining? View our Get Involved page! Manages our social media strategies and presences. Connect with us on Facebook, Twitter, or LinkedIn! CATIS, a subsidiary of the International Centers for Appropriate Technology and Indigenous Sustainability (iCATIS), is a non-profit located in San Miguel, Mexico focused on helping local communities develop technologies to help with water quality, sustainable agriculture and construction, and women’s issues. They have developed a ceramic water filter and have partnered with Melissa Lenczewski, Director of the Institute for Environmental Sustainability & Energy (ESE) at NIU, to test these filters. Through their connection with Dr. Lenczewski, they are partnering with the NIU chapter of Engineers Without Borders (EWB), who has developed a special insert for the devices to filter out dangerous levels of arsenic and fluoride that are found in the ground water. CATIS has asked the Collegiate Association of Unreasonable Social Entrepreneurs (CAUSE) to help develop a marketing and distribution strategy. 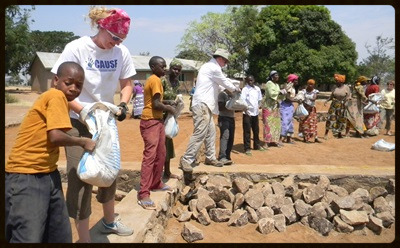 A team of CAUSE students began working on this project in early January 2014. The project will entail conducting analysis of the product, market, culture and best practices in similar industries. The final deliverable will be a marketing and distribution plan, delivered by the team of students at the end of their Spring 2014 semester. The students will help launch and implement the plan during a site visit to San Miguel, Mexico in mid-May 2014. Dr. Christine Mooney, Co-director of the Center for Social Entrepreneurship and faculty advisor to CAUSE, is serving as the supervisor on this project.